Yes, yes, I was in disbelief as well... Incredible! Apple has told The Verge that it is now moving to a yearly upgrade cycle for Mac OS X, but The Verge also notes that Mountain Lion is no Snow Leopard simply with performance improvements. Nope. It's a completely new OS. Mac Messages is also available in beta, now. 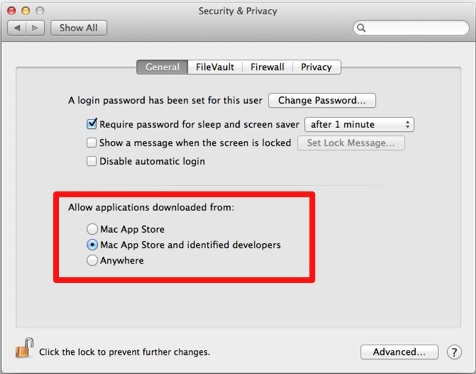 "...and Mountain Lion will ship out of the box restricted to running only signed apps and apps from the Mac App Store." That's fine for me. Developers can very easily get their certificate, sign the app and everyone is in a much better place in the end. Much more secure, but with keeping the freedom to install apps from anywhere you got it from. It's also a simple click away to unrestricted territory. Game Center looks to be interesting. Cross platform play between iOS and Mac. Nice. and you know how easy or cheap it is to get a certificate? Will they actually approve things like Winery that makes other apps? will the other apps you make then be blocked on your own machine? Will Crossover ever be able to be approved.. or any program that runs other software? I think Apple wants to lock down the system but are afraid to... don't be surprised if in 10.9 that the "unrestricted" option is gone. The certificate process doesn't involve application approval like in the MAS or App Store. You register at Apple, they do a check on you for information and etc. to approve you for the certificate, then you self sign the apps. The only barrier here is if it requires you to have a developer account, which could cost you that $99/m fee. Even so, I don't see why Crossover wouldn't be allowed in the MAS, theres already a Wine wrapping app in there. About total lockdown, I don't think Apple would actually go that far. Gruber got the impression that Apple seems to know their boundaries when it comes to OS X and iOS. I haven't got a reason to doubt Apple on this, they haven't made many mistakes lately. It also wouldn't make sense to introduce certificates and then take it away the very next year. Also the OS seems to be downloading new crypto keys every day, and this also gives apple the ability to kill every app remotely on all macs. certificate, rendering the app (along with any others from the same developer) inert on any Mac where itâ€™s been installed"
A noble idea for bad software, but now it's more big brother apple than ever before. Also Wrappers spit out via wrapper creator app cannot get automatically signed, and you have to tell every user then to lower his "securtity settings" to run a wrapper for example. 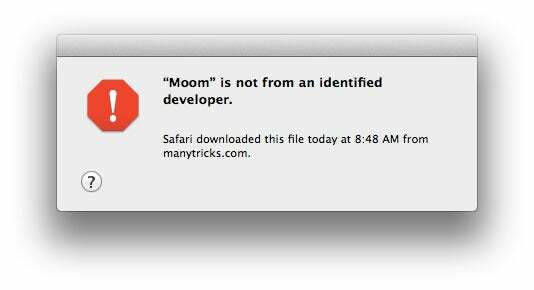 Also every working Mac software out there not coming from the new app store will display a nice error message to users that the app cannot be launched. ...and then there will be a freeze on 10.8 and most users would likely never upgrade. They would lose millions. I think it's absolutely ridiculous that they would even consider destroying the other options that don't pertain to their company....their apps.....their rules. If Apple were a government I'd be packing up and emigratingthe hell out to Ubuntu or somewhere else of the sort....I guess time will tell. looking more at whats required... getting a cert isn't hard, but its still annoying to people making wrappers or sharing them. Its psychology. Instead of forcing Mac users to only use the App Store, then are instead trying to use psychology to make the users choose it for their own good.... then Apple gets a bigger cut of everything. it looks like the way its currently set up, you don't have to do this. The first time you run the app if it gives the error, then you can right click the app and select Open, then it will open anyways... and gets past gatekeeper, and any time you run the app after that it will keep running normally. If you cannot force something on someone you want to do... then you use psychology to convince them it was their idea in the first place. To be honest, I'm quite impressed by a few of the new features (though they were all but unexpected). If things are as they seem, I'll probably be upgrading as soon as the final release will be out. 15:11:49 <@syao> help option? you mean the (?) small button? 15:15:01 <@syao> help window is kinda useless..
â€¢ On the yearly updates: Hopefully they won't break as much stuff as the current updates do. I'm talking about Cocoa methods deprecated/dropped, lots of new apps not working <release version> - 2 and old apps not working on the current release. â€¢ On Gatekeeper: They already had something like that, even though much more limited. 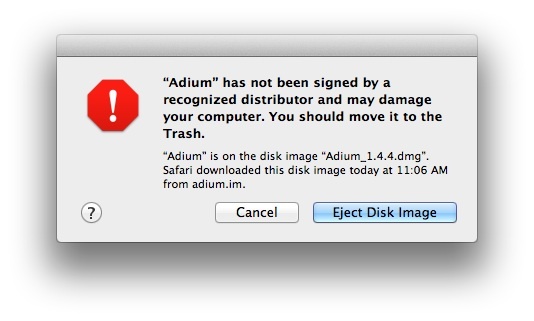 Recent OS X versions already come with a (sort of blacklist) antimalware to get rid of some well known malwares. They're extending it a bit now, and asking to digitally sign apps. That way they have a bigger control, and it makes it easier for them to cut off malware makers. That's not as bad as it sounds. Since the number of OS X based computers are increasing (lower prices compared to a few years ago - even lower than many comparable computer from Sony, Dell, etc; increased Apple popularity thanks to iPhones, iPods, iEtc; not to mention how craptastic windows 8 is gonna be), they don't want to fall in the same hell Microsoft currently is with their Windows when virus and malware makers will start targeting OS X en masse. I'd rather live in a (low-)walled green garden than in a scorched, gray field (as much as I prefer living in a high walled iOS garden on a mobile device, rather than in an Android quicksand). This may cause problems for cracked apps. But it also may not. If one wants to run cracked apps, it's still possible to allow unsigned apps anyways. â€¢ On Game Center: I'm not much of a gamer, just a casual one. I'm not a fan of social network stuff either, so I can't say I really use it much on iOS. I opened it a few times, I don't mind the 'achievements' thing, but I can't say I have much of a use for game center. â€¢ On notification center: This alone stole my soul. I absolutely love it (yeah, I'm a Growl user and can't live without it - I like ot know what happened while I was away or to have things put on a side waiting for my attention when I'm busy with other stuff). Hopefully it'll be more widespread than Growl, being a core OS feature now. I also hope, we'll see some growlnotify-like utility to make use of it (or I'll have to write my own), since I use Growl a lot with Terminal / shell scripts / etc. â€¢ On Messages: I'm already using the beta. It's absolutely amazing, at least for me. Now I don't have to type on my iPhone's small keyboard (or pair my extra bluetooth keyboard with it) when I'm at the desk (hopefully they'll fix it to use the phone number as well other than the email address, since many of my contacts refer to me with that one :x). And I can pick off a conversation from the iPhone where I left it. Ah, I forgot to mention, this also means having to use less skype-resource-hog-stuff. â€¢ On AirPlay mirroring: I don't own an Apple TV, even though I might consider getting one someday. But it's a nice feature in any case. â€¢ On iCal: The calendar list is no longer in the awful, annoying popover they used in Lion. Back to an usable interface. Finally. â€¢ On Notes: I occasionally use it on the iPhone and on Mail, and it's not bad. I also like how you can convert a note to a desktop sticky and vice versa. I wanted to have synced sticky notes some times, but Sticky Notes.app couldnt do iCloud sync, nor could leave stickies when you closed it. â€¢ On Reminders: I preferred having Reminders and Events in the same app. I'll have to live with two separate apps. I hope they'll let me drag a reminder to iCal to create an event and vice versa (feature currently broken in Lion iCal, if you use iCloud). â€¢ On Sharing, Twitter, etc: I couldn't care less. I mean it. Well, okay, I lied. I like AirDrop integration. But they can take back all the social network stuff, I don't want that. - If I swipe left to show Notification Center, what do I use to go back one page in Safari/Firefox? Or it's a different number of fingers swipe? This â–ˆâ–ˆâ–ˆ will be left blank in sign of protest â–ˆâ–ˆâ–ˆâ–ˆâ–ˆ internet censorship. I must admit i still use Snow Lep more than Lion. Although I like how trackpad inter phasing with the system a lot, there are still thing I like less. LaunchPad have really grown on me and I miss it on SL, but iCal is so much nicer on SL and I really miss rosetta. I've yet to encounter any apps that won't work on SL yet, but I guess the list will grow. I guess when CiderX is out I'll consider updating to Lion on my desktop, but until then I'll stay on SL. I've usually upgraded pretty quick when a new OS is released, but for some reason I still think SL is the better choice for me. osx has been consistently getting worse since snow leopard (hate lion and hate the look of this more and more). They give you the option to turn off restrictions like app stores app only. But mountain lion should be a update to lion and not a separate realse. Cause like really lion came out like less then 7 months ago. It's seems like just a big pain to keep on spending $30 over again and keep on downloading 3gb of an operating system. Like I have already wasted 6gb downloading lion twice . Once it failed and second it worked. This may well be a good thing for the circle of users that only dabble in Apple's new walled garden then. Fact is, every existing Wrapper (roughly millions) out there, cider or WS, will display these nice error messages or scaring off users. Always something different with Apple; I wouldn't be surprises at all if they disable the ability to run non-Store apps completely in one of the next big cats. @devilhunter this is EXTREMELY bad news and is something i think is worse than SOPA and PIPA unless as said earlier you can turn this off (why the heck would you turn it on anyways unless you don't have a brain)!!! When I started using Macs in 1996 Apple was tilting straight towards bankrupcy - then Steve Jobs took over again and introduced the "Think Different" campaign - since then I could always identify with the company philisophy - the main reason why I turned into a Mac enthusiast in the first place - however turns out that all of it was obviously just an empty slogan to push sales for a certain target group. As the target group changes/broadens company philosophy changes - Apple is now just another IT company jumping onto the most profiable bandwagon imho. I'm still on 10.5 because of some ridiculous icon cache issues I'm expriencing on 10.6 which render many of the icon graphics of the OS blurry or invisible after a while - this is absolutely unacceptable - hundreds if not thousands of bug reports have been filed about this particular issue but there has been absolutely NO response from Apple on this issue whatsover - let alone a fix - how could this be you ask? - well the only logical explanation I can come up with is that Apple knows exactly that they can now afford to ignore such problems and instead tell you to upgrade your OS as it won't impact sales or profit anymore in a negative way. I'm not sure what to think... the features look nice, but a new OS update just for that? Most of that stuff is not even that useful for me whithout an iOS device and just one Mac. I would find notes and reminders much more useful if I had a device which I would carry around, but with only one Mac it's more effective and simpler just to use real paper stickies. Gamecenter is useless, until Mac game developers finally get thei sh** together and give Mac games the proper treatment. Gatekeeper is the part that scares me. It's not made for us, OK I get that part, it's made for people like my mum, who barely ever uses a computer. Fine. And these people are not even interested in wrappers, Wine or such stuff, so they would never see these warning messages anyway. The part that scares me is how far Apple might take this in the future. Another concern is the design of of the message. It looks like a major issue, but most of the time it' strivial. This could lead to an effect similar with the Windows warning thing where users just get used to allowing everything, they won't notice when the warning is actually legit. this is very sad for me osx has been consistently getting worse since snow leopard (hate lion and hate the look of this more and more). apple please don't pull a microsoft If they start adding restrictions like this. What exactly is wrong with Lion? Funny you mention this. My mini server which runs 10.5 has a similar problem. After its running a few days, most icons on the desktop get completely scrambled, even the hard drive icons. The scrambled icons will display parts of other icons, or very small icons, or become extremely fuzzy, or change every time with a click of the mouse. I suspect that this is a fault of Quicklook, since Quicklook is broken as well for images then when the icon issue pops up. reinstall didn't help. Curious.. I used to have this problem on Snow Leopard, but it got fixed by itself, I don't remember whether it was after a system update or a Caches cleanup (i.e. through Safe Boot). I've had it again recently on Lion though, after the 10.7.3 update. I did the update before it was pulled and re-published, so I'm afraid it broke something. If neither this nor a full Caches cleanup will help, I'll download the 10.7.3 combo update and try with that. About PeerGuardian, I'm told there's a version that works on Lion just fine, maybe you might want to give it a look. Even though (if this is for p2p stuff) I'd rather set the blacklist directly in Trasmission without other heavy software running... Unless you use PG for another reason, that is. It looks as if many (if not most) OSX users have experienced the SL icon bug at some point - some more often than others - most people seem to classify it as unimportant though - fact is it gets more severe the more custom icons you use on your system, which means I'm totally screwed with my huge icon collection. The problem pops up every time for me after about 1-2 hours of system uptime and intensifies to the point where it gets hard to identify stuff on the screen. I also had icon issues when I was still using OSX 10.3/10.4 - (garbeled icons moslty but not blurry ones) - however those where not nearly as persistent or annoying as the 10.6 bug. It basically renders SL useless for me. Apparently, you can still run unsigned apps, no matter what the GK setting is, if you option-click them the first time you run them. Then it won't bug you anymore. Not *that* bad I guess. While its not bad for a power user... it means in about 5 years fro now it'll be rare for a normal user to be running anything that isn't in the Mac App Store... when people aren't using software in other places, that software ends up dying off, so over a long period of time, eventually 99% of everything will be the MAS, with a few registered devs as exceptions. And does adding like 3 -6 new features justify a whole new realse ? Plus wasnt lions whole goal to bring the iPad to Mac . So what's the point to have a new realse and charge $30 again for something that was promised in lion . So, you're pissed at Apple for not giving features for free that were never advertised in Lion? Makes perfect sense. Were you complaining when all the other OS updates came that included new features as well? But they are smart to realse the new o s 7-9 months after lion this way all the warrentys and return policy's on lion expire before 10.8 comes out. So, a high-ranking person or an official press release stated that Messages, Reminder, Notification Center, a standalone App for Notes and Game Center will be added to Lion for free? You just complained about needed to download ~4GB again for another update but than you saying your getting the preview. If people are looking for massive UI changes, don't bother getting this preview. Although Apple lists that there will be over 100+ new features (not 3 to 6), you aren't going to notice much in this current release. Other than the few features making headlines, (Messages, Notification Centre, Safari, etc) you won't see much. I think this new OS is just stupid, its just like the game Madden. Madden 01', 02', 03' and so on with hardly noticeable features until someone points it out.